Starting in 2015, the Global Initiative against Transnational Organized Crime (Global Initiative) has consistently undertaken work examining the relationship between the artisanal and small-scale gold mining sector (ASGM) and illicit activity. Both ASGM and organized crime are global issues, impacting countries and people in every corner of the world. The predominantly informal nature of the sector, paired with the windfall profits to be made makes ASGM and the related gold trade ripe for criminal exploitation. However, the degree of illicit activity greatly varies from region to region, and even with countries, and takes on a number of difference forms with a multitude of various negative impacts. From mining, to smuggling, to money laundering and threat finance, gold is a valuable commodity exploited by criminal actors in a multitude of ways, often to the detriment of incredibly vulnerable populations. The expansive and diverse nature of the relationship between ASGM and illicit activity is not an easy one to dissect, and in turn develop responses to. The relationship between gold and illicit activity is incredibly multi-faceted and complex, and it is often not immediately clear how far-flung criminal and threat actors are contributing to or profiting from ASGM. In particular, an emphasis on supply chain management and transparency, as is the focus of many international initiatives to date, is not sufficient to fully unpack what is a convoluted web of actors and transactions. Rather, to identify vulnerabilities and possibilities for effective intervention a more holistic approach is necessary which includes a look at financial flows and political economy analysis (‘the interaction of political and economic processes within a society: the distribution of power and wealth between different groups and individuals, and the processes that create, sustain and transform these relationships over time’). To date, work on this issue by the Global Initiative has largely taken place under the umbrella of the GIFF Project, a partnership between the Global Initiative and Levin Sources. Resources that have been published include Follow the Money: Financial Flows linked to Artisanal and Small-Scale Gold Mining, a handbook designed to enable practitioners to investigate and map financial flows linked to ASGM, and Follow the Money: Financial Flows linked to Artisanal and Small-Scale Gold Mining in Sierra Leone. Other work by the Global Initiative in this area includes an investigation into Organized Crime and Illegally Mined Gold in Latin America and illicit financial flows (IFFs) stemming from ASGM in Liberia and Ghana. While a number of undesirable outcomes are associated with illicit activity in the ASGM sector, how illicit actors contribute to the continued use of mercury is a critical and pressing concern. Mercury is often used to help extract gold from mined ore. Although inexpensive and relatively effective in extracting gold from ore, mercury emissions and releases can cause serious harm to people and the environment when handled unsafely. Recognising the threat, a call for global action was initiated in 2009 which culminated in 2013 when the Minamata Convention on Mercury was adopted. The Convention mandates a reduction, and elimination, if possible, in mercury usage around the world, including in ASGM. The formalisation of ASGM and the elimination of mercury usage go hand-in-hand. Building a better understanding of financial flows and their impact on ASGM is therefore vital. Recognizing the need for a greater understanding of gold-related financial flows to strengthen international responses, UNIDO and UNEP have become strong partners and advocates for a better understanding of financial flows linked to ASGM. These two reports are a component of the preparatory phase of the GEF GOLD child project (under the program: Global Opportunities for Long-term Development of ASGM Sector: GEF GOLD) entitled Contribution towards the elimination of mercury in the ASGM sector: from miners to refiners in Mongolia and the Philippines. UNIDO and UNEP are co-implementing the child project in Mongolia and the Philippines in association with the Mongolian and Philippine governments. In support of the program, the Global Initiative undertook a rapid assessment of gold and financial flows linked to ASGM in Mongolia and the Philippines in collaboration with Levin Sources and BAN Toxics with financing from UNIDO in the framework of the GEF GOLD project implemented jointly with UNEP. 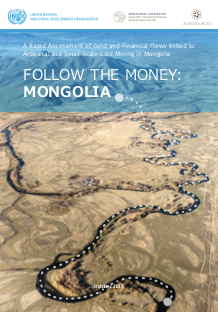 Together, these two reports provide a nuanced first-look at how stakeholders can better understand and respond to the role gold supply chains and financial flows play in formalisation efforts in Mongolia and the Philippines. 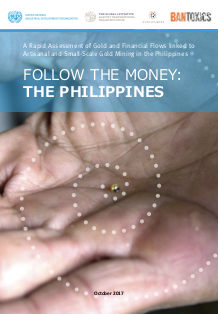 Through a brief situational analysis, the reports identify red flags and vulnerable points in gold supply chains and financial flows which may inhibit efforts to formalize the ASGM sector in Mongolia and the Philippines. In addition, key findings and recommendations provide guidance on additional investigation and action that is necessary to enable financing schemes and other interventions which facilitate the introduction of mercury-free technologies. These assessments are designed to inform the writing of a subsequent proposal and the early stages of the associated project’s execution through increasing understanding of gold and financial flows linked to the Mongolian and the Philippines ASGM sectors. Moreover, it is hoped the reports will provide inspiration and guidance for similar assessments in other gold producing nations. ASGM is an important livelihood activity for rural Mongolians. Practical inaccessibility, a product of the vast geographical size of Mongolia paired with the centralization of the legal supply chain, is a key barrier to formalisation for Mongolia’s ASGM. A lack of coordination between central and local government (soum level) in the management of ASGM and lack of manpower and resources to implement legislation, at all levels, is a barrier to the efficacy of mining reforms and formalisation initiatives. Soum governors play a pivotal and potentially dichotomous role, which can jeopardize formalisation efforts. The Bank of Mongolia conducts very limited due diligence on supply chains, enabling gold extracted using mercury to be easily laundered into formal supply chains. Processing plants hold a key position in supply chains and financial flows, which can pose a significant challenge to securing supply chains and financial flows. Ingrained illegal trade networks and financial relationships with Chinese nationals are likely to undermine efforts to secure gold supply chains.